We are committed to our clients, because we believe that teamwork yields positive solutions. We are dedicated to help our clients make effective decisions that respect our environment and sustainable infrastructure values. 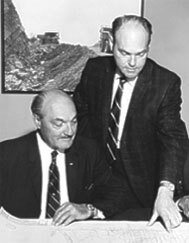 Chastain & Associates was founded in the spring of 1954 by brothers, Homer and Edward Chastain. After being awarded a 909,000 square foot expansion project for Caterpillar's existing facility in Decatur, the brothers mortgaged everything they owned to meet the increased payroll and staffing demands of the project. Over the years, we have completed numerous projects for Caterpillar, and are proud to have them as a friend today. In September 1954, the brothers were also involved in the early development of the Illinois State Toll Highway, formerly known as the Northern Illinois Toll Highway. Chastain was among several firms supporting Joseph K. Knoerle & Associates, Inc. of Chicago, Illinois in the preparation of the final feasibility report and construction cost to develop 481 miles of the proposed highway. To-date, Chastain has completed over 70 projects for the Illinois State Toll Highway Authority and maintains a strong relationship with the agency through open communication. In 1956, Chastain was awarded one of the early contracts issued from President Eisenhower’s signing of the Federal-Aid Highway Act of 1956. Chastain provided Phase II design engineering services for a 22 mile section of I-57 in Union County. With the successful completion of this and numerous other projects, our 57 year old alliance with the Illinois Department of Transportation has allowed us to complete over 100 transportation projects for the State of Illinois. Throughout the decades, Chastain continued to grow and has established branch offices in Schaumburg and Rockford. In the last five years, Chastain has acquired two additional engineering firms strengthening our Land Development Division and allowing us to support several communities in Northern Illinois. In 2017, Chastain acquired BGM & Associates, Inc., a company headquartered in Decatur, Illinois providing engineering and surveying services for over 40 years. This acquisition not only enhances our existing services, but also allows us to expand our services to Water and Sewer Treatment Plants, as well as, expand our services geographically with an office now in Benton, Illinois. Today, we are a professional land surveying, land development and civil engineering firm providing a wide variety of services for numerous municipalities, counties, state and local agencies, industrial and private sector clients throughout Illinois. Chastain is guided by the principles of building and maintaining long-lasting client relationships. We are dedicated to providing responsive, quality engineering utilizing a team approach, half a century of hands-on experience, united with current technology. We are proud to actively support the following organizations.